Do you see these garlic bunches? This isn’t the garlic typically found in American markets. You know what I’m talking aboutâ€”big, fat Chinese garlic, often sold in little net bags, five heads for a dollar (at least that was the going rate in New Mexico when we left). Cheap. Ubiquitous. And slightly bitter. But these heads are small and fragrant, sharply flavorful, almost flowery, but never bitter. This is the garlic preferred by Asians everywhere from Vietnam to Burma to Nagaland. It’s a part of every meal, often pounded wholeâ€”skins and allâ€”then incorporated into curries and stir-fries. So coveted it is, some of the Vietnamese participants in the IMMF course last month wanted to go home with sacks of Thai garlic because they’re experiencing a shortage. These days, their markets are flooded with the Chinese variety, and they don’t like it. Well, if you’ve been reading this blog for any amount of time, you know I love garlic. But I’ve learned a few things in recent weeks, and I’m going to make some changes to our kitchen back home. Two new staples shall be kept on hand: a stash of crispy fried garlic stored in a bit of oil, and the leftover oil from frying that garlic. It’s so simple, I can’t believe I haven’t always done this. I recently met up with Andy Ricker and his agreeable Thai business partner, Sunny, here in northern Thailand. They shared one of Pok Pok’s keys to tasty laap and other dishes: garlic oil (Andy says they use soy oil in Thailand but rice bran oil in Portland). You can make a fish laap with northern Thai spices, fried in regular oil. Or you can fry it in garlic oil, and your view of laap will expand dramatically. Try it. Perhaps you will never go back to basic oil. And the crispy fried garlic? This I picked up in Shan State. Most every noodle dish sold on Kengtung’s tiny streetside tables came with toppings of shaved cabbage, ground peanuts, chile paste and a heaping spoonful of crispy fried garlic (or shallots). 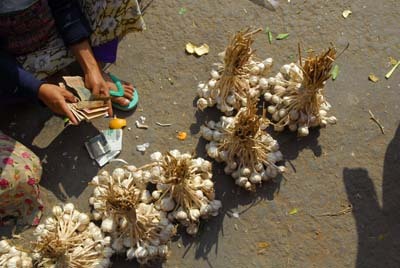 Vendors store the garlic, often covered in a fine layer of oil, in big plastic tubs. Beautiful. Brilliant. Necessary. It’s easy to make crispy fried garlic, especially when you don’t care so much about perfect little slices. You can do it the professional chef way, carefully shaving each clove into tiny sliversâ€”but never brown or bitter. But that takes time and dexterity with a knife. Far simpler: pound a bunch of small garlic cloves, toss into a wok of hot oil and fry. (Add pounded turmeric to the mix, if you like.) Fry until golden but remove before browning. Drain on a paper towel, then store in an air-tight container, with or without a layer of oil. I completely agree – not all garlic is alike!! We thought the street food (and food in general) was quite good – tangy, spicy, varied – in Burma. We’ve met lots of travelers who complained about Burmese food, but we enjoyed our culinary exploration of Burma. I know what you mean. Burmese food seems to have a poor reputation among travelersâ€”unwarranted, in my opinion. Check back in six weeks or soâ€”we’re planning another trip through the country, with plenty of time to eat and explore. Nice post on the Thai garlic – it has long been one of my favorites. There are sweet and mild Central Asian strains now available in N. America as dried spice, bulb or seed that are close to the base of the garlic family tree as well. (Another upside of the breakup of the Soviet Empire!) We have a small but persistent (in the face of neglect) garlic patch at home that contains gentle Tibetan and spicier Persian forms as well. Every kitchen should have garlic n’ oil in their fridge. I need to look for the thai garlic at the local asian groceries: I’d forgotten how REAL garlic tasted like until we went back to the pHilippines to visit family. A fewtiny nubs of native garlic had more flavour in them than a whole head of the chinese garlic. Lor, can you believe my father hates garlic? He smells it on me every time I see him. More Burma food coming soon.